By introgressing exotic germplasm into elite maize in the USA, breeders have developed lines with wider variability for seed oil and protein contents than in U.S. adapted lines. Seed quality of these introgressed lines has not been evaluated. The objectives of the study were (i) to characterize introgressed inbred lines for seed quality, (ii) to assess the effects of oil and protein contents on seed quality, and (iii) to determine whether the interaction between genetic background and production location was significant. The lines used in the study were developed by crossing elite lines of Stiff Stalk and non-Stiff Stalk heterotic background with St. Croix and Argentina germplasm. They were grown at four locations of the U.S. Corn Belt. Seed quality was measured by standard germination test, a series of vigor tests, and an inbred quality index. Genotype × location interactions were significant. Genotypic differences were observed for all the traits measured within each location. Seed composition and genetic background did not affect germination, however production location did. Standard germination ranged from 56 to 93% in Iowa, 48 to 89% in Missouri, 53 to 91% in Illinois, and 52 to 89% in Nebraska. High protein inbred lines had a saturated cold test of 64%, averaged across locations, while the low protein line averaged 49%. Inbred lines with St. Croix background and lines produced in colder locations (Iowa and Nebraska) had high cold test percentage. Inbred lines with St. Croix background, all having low oil contents, had the lowest accelerated aging test results (49%), whereas inbred lines with Argentina background had the highest (65%). The low protein inbred line had low accelerated aging results (49%), whereas high protein inbred lines averaged 62%. Because seed composition affects seed quality of the inbred, it is important that breeders evaluate new germplasm for seed quality early in the breeding program. This article is published as Munamava, Miriam Rukero, A. Susana Goggi, and Linda Pollak. "Seed quality of maize inbred lines with different composition and genetic backgrounds." Crop science 44, no. 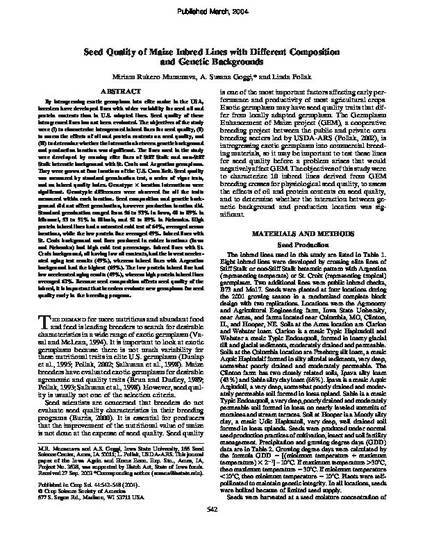 2 (2004): 542-548. doi: 10.2135/cropsci2004.5420.